Charlie is the one on the right. 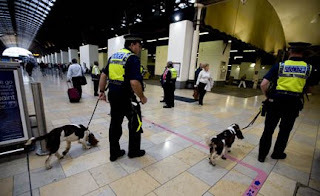 These four British Transport Police were at Paddington station and so I just had to take pictures and when I stopped to talk with them one of the policemen gave me their dog's card. Charlie's card said, "Charlie is a liver and white English Springer Spaniel born in 2004. He is a dog that seems to do everything at his own pace and loves work." I used to have a dog named Charlie.